Ladies and gentlemen, start your engines! 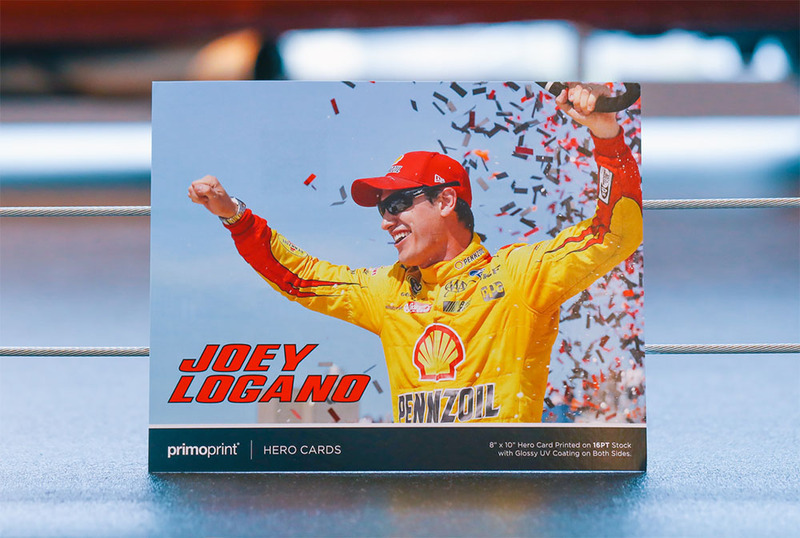 Since Primoprint HQ is in the heart of NASCAR country, we’re thrilled to announce our newest product line for the racing industry: Hero Cards! Hero cards, also called driver cards or autograph cards, are oversized postcards that promote racing drivers, teams, and their sponsors. These brightly colored marketing pieces pack a powerful punch because of their size and attractive graphics. Popular sizes include 6” x 8”, 8” x 10” and 8.5” x 11”. Hero cards are available on 100LB gloss cover with Aqueous Coating, Glossy UV or Matte coating. You’ll often see drivers sign hero cards and handing them out at Meet & Greets, VIP tents, and other live events. They’re a staple of the racing industry, for any series and level (NASCAR, Whelen, Late Model, World of Outlaws, Go-Karts, US Legends and more) and are fun for fans of any age to collect and showcase. Why Print Custom Hero Cards? 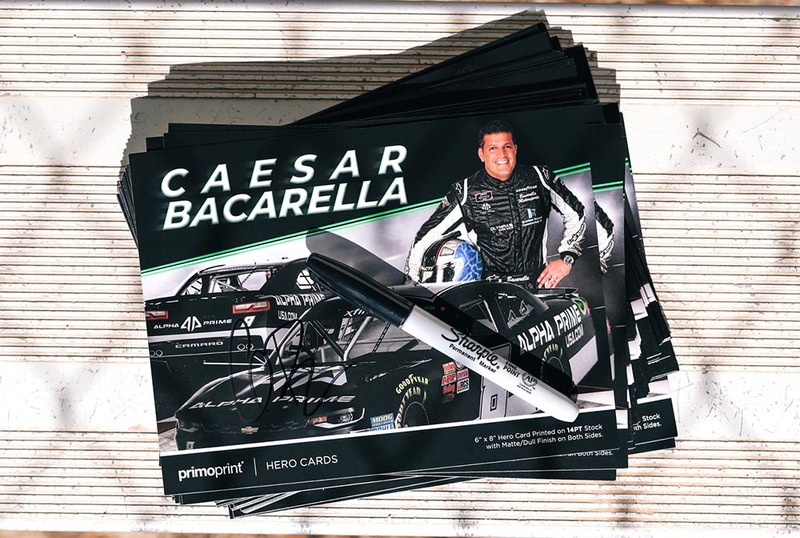 Since fans often want to know everything about their favorite driver, autograph cards provide a way to share that information. Die-hard fans often display these collectible items in their homes or put them in binders. 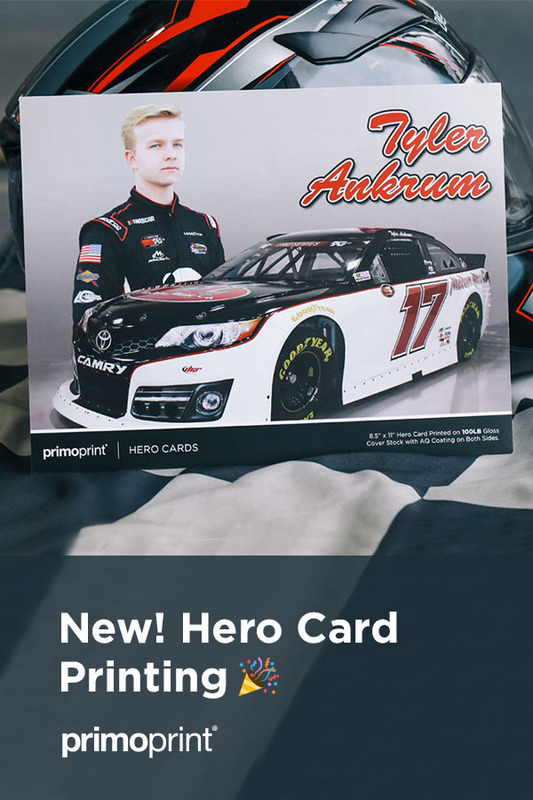 All drivers can use custom hero cards as a way to advertise for their sponsors. It’s a win-win for both driver and sponsor, creating a way for fans to become familiar with a driver’s sponsors and a method for sponsors to gather a fan following because of the driver. 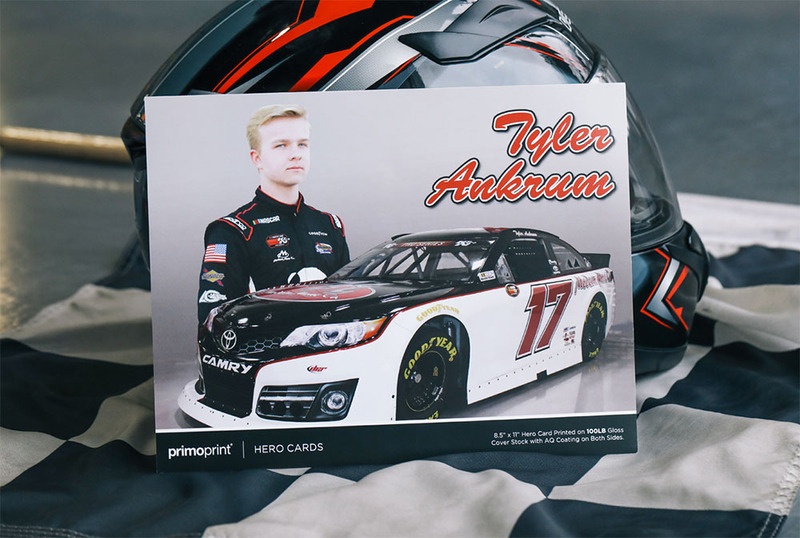 While hero cards are the cornerstone of racing team marketing, Primoprint is also available to help with all print marketing materials for your racing team. Don’t worry, your friends at Primoprint have you covered (yay!) with business cards for everyone on your racing team. Trading cards are another excellent print product for drivers. Even though they’re smaller than hero cards, trading cards are easy to have on hand, and fans love them. Now that racing is more mainstream than ever, stickers make a great way to spread brand awareness for race teams. They look good on bumpers and coolers, too. We hope you’re as revved up over our new hero cards as we are! If you’d like to take our products for a test drive before buying for your race team, fill out the form and we’ll send you a free sample pack that includes hero cards, trading cards, business cards, and stickers.